There have been many events commemorating the centenary of the First World War and its key moments. 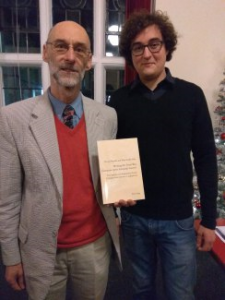 A new book edited jointly by an Oxford academic, Toby Garfitt, and a young researcher from France, Nicolas Bianchi, takes a fresh look at some of the literary responses to the conflict on both sides of the Channel. 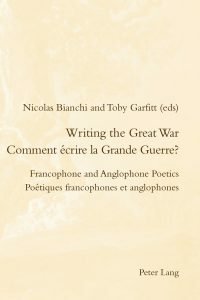 The volume is deliberately bilingual, and is entitled Writing the Great War/Comment écrire la Grande Guerre? This was very much a collaborative, interdisciplinary project, bringing together specialists from departments of English and French Studies in Britain, France and Belgium, and the preface is by the distinguished war historian Sir Hew Strachan. The subtitle, ‘Francophone and Anglophone Poetics’, makes it clear that the word ‘Writing’ in the main title is essential. Just how do you write such an overwhelming and unprecedented experience? French authors favoured prose, with some major exceptions, but how far could and should prose negotiate the line between realism and invention? English authors favoured verse, but that verse needs to be appreciated in a wider context of writing. There is a proliferation of voices, registers and styles, with traditional genre-distinctions often breaking down. How can one reconcile the complexity of experience and perception with literary form or political ideology? What is the place of irony and humour? What types of character are developed? What do we know about non-European, non-white perspectives on the war as revealed in poetry and songs from across the world? You may know, or think you know, about Owen and Sassoon, Apollinaire and Barbusse and Céline, but what explains their different perspectives? What about their personal letters, what about the process of writing and correcting? This book offers a stimulating challenge to readers on both sides of the Channel to broaden their understanding of texts, contexts, and critical studies (the bibliography is particularly full and helpful).